Mount Wutai is a sacred mountain, one of the Four Sacred Mountains in Chinese Buddhism. It takes its name from its unusual topography, consisting of five rounded peaks (North, South, East, West, Central). Mount Wutai is home to some of the oldest existent wooden buildings in China that have survived since the era of the Tang Dynasty (618-907). This includes the main hall of Nanchan Monastery and the East Hall of Fuguang Monastery, built in 782 and 857, respectively. I had finally made it: Wutaishan. It's not the last one for my China WHS but certainly one that should have been visited earlier than a few odd ones on the list especially seeing that it's only a <5h ride from Beijing (west 2nd ring road even but rush hour would add another hour for sure). Personally I had always put this off because I wanted to go via public transportation or at least a long-distance bus but in spring there is only one bus from Beijing daily, the train arrives at the nearby town of Shahe at midnight, the return train (requiring to buy a ticket from Taiyuan but can be boarded anywhere) is a sleeper - altogether this doesn't sound so bad but then you take a minivan to the Wutaishan area, pay for the green bus routes to get around, return to the main town. All this hassle? I found a tour instead. I usually hate them but avoided all shopping and prayer sessions, didn't mind the 5am wakeup calls, the mediocre food and the staff were super friendly. The only downside was the local guide who was BSing a lot of the religious aspect, i.e. "you give a certain deity a (monetary) gift and you'll feel better - get rid of your nightmares...", the restaurant also tried to offload "blessed" beads before you get something to eat. As part of the tour the entrance ticket was included, the green bus ticket is not mandatory, but you still have to pay for the temples themselves that require a ticket as well as the ski lift to Dailuoding temple. The tour only includes visiting said temple, not enough time to do the pilgrimage hike up the stairs so you either pay for the return lift or stay around the shopping area. The first day was mainly spent at Zhenhai Temple where the guide literally explained every nook and cranny here. Next stop was the large Xiantong temple (pictured above), one of the five Zen temples. Another short visit was Puhua temple, and the last one a small temple called Luohou. If setting your own itinerary there appear to be a dozen places to visit in this area alone but I'm not sure they are open for visitors. For these the guide didn't spend much time explaining anything. Overall I don't think I can justify spending "only" 2 days in this area but I'm also not interested to see more temples. The view from the Dailuoding is magnificent, with the iconic stupa of Tayuan temple (pictured) suddenly feeling less impressive than standing next to it in the valley. April still had snow but I was also unlucky with the weather - the first day was around 0 degrees Celsius. The next day was ~10 and I peeled off a layer. Beijing, just to compare, is close to 20 around that time. Went with a friend Sept. 8-11th. Many things have already been said on how beautiful this place is; so I won't add anymore on that. It is definitely a place to visit! From the Wutaishan Railway station, there are buses to Taihuai town for 20RMB - takes about two hours to get to town. The entrance fee for Wutaishan is 220-ish RMB per person (quite pricey) though the free shuttle bus rides within Taihuai help in visiting many temples. Trips to the mountain peaks will need bus tickets ranging from 60-80RMB, depending on which of the five peaks one wishes to visit. My friend and I decided to choose the South Peak since our guide book mentioned it is the most beautiful among the five. In general, these mountain peak bus trips take 1.5 to 2 hours (one-way) and the driver gives guests 40 minutes to one hour time to worship and/or take photos. The shuttle needs a minimum of ten passengers before it leaves. I have to agree on the comments written earlier about the new buildings constructed in Taihuai town. Many restaurants, hotels, toilet rooms and souvenier shops were built "temple style" to somehow fit with the scenic landscape of Taihuai - and some were poorly designed and even ugly. Clearly, these buildings are for tourism purposes but I would sure hope they'd be placed far away from the Tayuan Pagoda area. We were lucky to visit Wutaishan during the weekdays. I can imagine how crowded the place must be during weekends and holidays. It is only 6 hours by train from Beijing and is a popular destination for a weekend trip. The most wonderful experience is visiting the south peak and hiking the hills around Taihuai town. Away from the noise and tourist crowd! Up there, one can really feel the sacredness of Wutaishan. How strange of life can be, I have to wait for eleven years to re-visit mainland China, but less than three months from my second visit, my feet were on this country again and this time my trip was Shanxi province, the land of western mountain with many timeless treasures and three world heritage sites, so Wutai Shan or Mount Wutai which literally means the five terraces mountains was my first place to visit. From Shanxi's capital, Taiyuan, I took a four hours bus though many farmlands and mountain valleys, it was a long but nice journey, on my bus, apart from couples of tourists there was a Buddhist monk and a few Tibetan lamas, I knew immediately that I took a correct bus. When the bus reached Wutai Shan area, I saw that Chinese government was building a new highway to this world heritage site; many parts of the highway were built on the small beautiful river valley or even cut though small gauges truly destroyed the scenic landscape. Not only the highway, there are many new towns construction, I read the ICOMOS report that in order to put Wutai Shan in the world heritage list; thousands of locals had been evicted to the new towns by governmental order changing traditional way of life. I only wondered how UNESCO accepted this ugly development plan since the original proposal submitting Wutai Shan to become a cultural landscape! When the bus reached Wutai Shan, I had to pay a very expensive fee to enter the area which sold including insurance and unlimited ride bus pass which in total almost 250 Yuan with remark that each temple in Wutai Shan had a separate ticket fee! Visiting Wutai Shan was visibly costly. The bus parked in the bus station few kilometers outside Taihuai, the main town of Wutai Shan, and then I took a very nice and modern local bus to Taihuai passing many ugly built temple style hotels and restaurants, a real uninspired sight for one of the holiest mountain of China. I stopped at Taihuai bus stop which once was a town center, but after whole town eviction, the town was now a large area of park with a magnificent view of beautiful temple complexes, a great vista but a little too desert. Wutai Shan was reportedly to be the abode of god and considered to be liked a Chinese Buddhism Vatican during Sui and Tang Dynasties, many emperors as well as pilgrims throughout East Asia and Vietnam came to worship Lord Buddha and Bodhisattva of Wisdom, Manjusri and the worship is still practicing even today. As I mentioned Wutai Shan was liked the Vatican, and the St. Peter Cathedral of Wutai Shan was Tayuan Si, Xiantong Si and Pusading temples, originally one temple, but later divided into three temples. 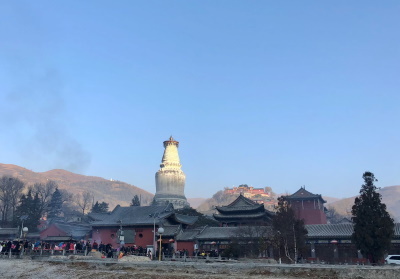 Tayuan Si was famous for it gigantic white Nepalese style pagoda, which was a symbol of Wutai Shan, the pagoda was simple but very nice to see, and the whole complex was full of Tibetan Buddhism things like praying wheel, praying flag and red coat lamas. After Tayuan, I went to Xiantong Si, this very Chinese temple was very large and had many buildings, and the star were the fantastic gilded bronze pavilion and the aging Manjusri Hall, which was considered to be one of the oldest brick building in China. I also visited the small Luohou Si where the famous Lotus Buddha was located, the unique Buddha statue that covered by large folded wooden lotus petals and can be opened like lotus blossoming showing Buddha statues inside, a great art and cleverly designed technique. My last visit was Shuxiang Si, a large complex only ten minutes walk from Taihuai. The reason to visit this temple was to see the famous suspension Buddha which ICOMOS recognized as one of the greatest art object in China. The suspension Buddha was in fact the large 3D wooden screen wall surrounding the six meters high golden Manjusri statue depicting the story of Chinese Buddhism heaven with many monks and angles. The screen was very large and had many details and made the whole building like a large fantasy stalactite cave. 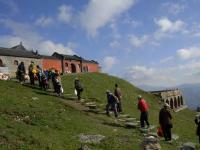 To be honest after visit Wutai Shan, I did not feel any impress or holy, everything seemed to be superficial organized. I also did not find anything special or unique even though the arts of Shuxiang Si and Xiantong Si were exceptional in my opinion. Wutai Shan could not give me the aura of holy place, but instead of an empty religious theme park with lack of soul. Compared to other holy mountains in East Asia like Shinto's Fuji and Nikko in Japan, Buddhist Gayasan of South Korea or Taoist Hua Shan near Xi'an in China, Wutai Shan was far behind in terms of spiritual inspiration. The environment was another problem, Wutai Shan really looked dry and waste, there were few big trees in the city center and surrounding areas, most of them were grass hill which plant to protect landslide. All in all, Wutai Shan was just a fine place to visit, for me who never been to Tibet, Wutai Shan gave me some Tibetan experience which I believed quite authentic enough in terms of culture and maybe environmental landscape. With a hefty fee and increasing tourists from new highway as well as the continuing eviction program, Wutai Shan was definitely changing and this reminded me what sadly development happened with Luang Prabang of Laos. 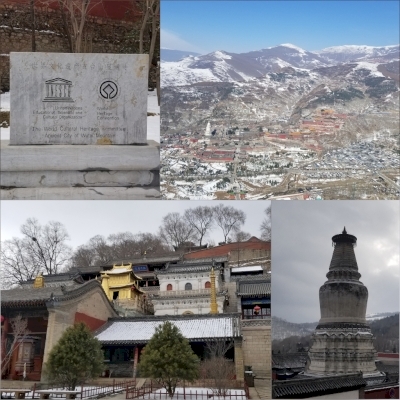 Visiting this place in such the year it was listed as a world heritage site and in such an interestingly important transitional period was maybe the sole highlight of my journey to this bygone holy mountain, Wutai Shan. 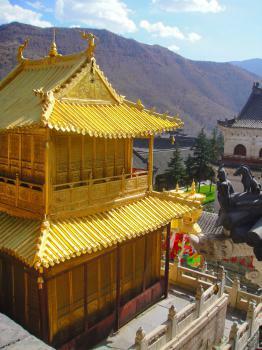 Glazed tiles: Pusading Temple, one of the few temples that allowed to use imperial yellow glazed tiles. Mao was here: Mao Zedong, Chou En-Lai and other revolutionary leaders made a brief stay in Taiyuan temple in April 1948. 53 Community Members have visited.